Today was an interesting day filled waiting, more waiting, fun, nervousness, worry, not so much fun and no fun at all. This morning, Cannon woke up at 5 a.m. ready to go. He begged me immediately for something to drink or eat as he had not had anything since the previous afternoon. We were waiting to start the procedure and they didn’t want anything in him that he could later throw up. I had asked if we could start as soon as he awakened because I knew this would happen. They said we would try but it would depend on scheduling. So, I let him watch a couple of videos and we read some books until about 7. Then, we headed down to the playroom where we would spend the next few hours. Cannon played with cars, trains, puzzles, books, Mr. Potato Head, the play kitchen, and his most favorite….a ride-on car. When he discovered the latter, it was all over! He was hooked! My boy needed as much sensory stimulation as he could get his hands on and this was his ticket to sensory heaven! 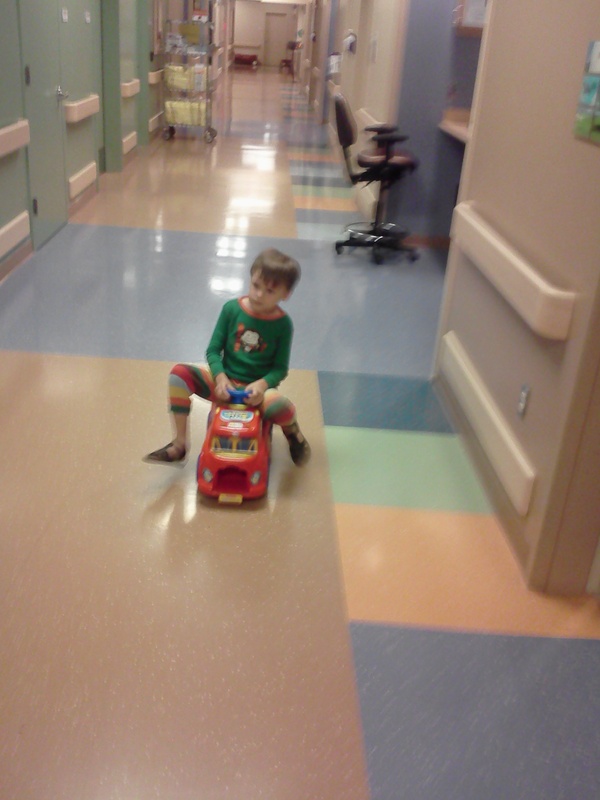 He hopped on the car and took off out the door of the playroom. Into the halls of the hospital. Those halls would not be the same for the next few hours! 🙂 Cannon is a very tall 4 year old so his legs were entirely too long for him to comfortably ride on this car. But, he did not care one bit. One look at that long stretch of open hallway (real estate) and he giggled. Then, he pushed off as hard as he could and tore down it! I could not believe how fast he was going! I literally had to run behind him to keep up! He wasn’t so good at steering out of the way of things at first. He would graze a cart of linens, veer into a doorway, or hit a nurse’s chair. But, eventually, he figured it out and was all good. Off and on, but mostly on, for at least 2 hours, maybe more….he did this. Cracking up nurses, startling doctors, and amazing other patients with speed as he went. We he got to the intersection of 2 hallways, I would have to beg him to slow down or just grab him so as not to run down some poor, unsuspecting passerby. He was happy! He wasn’t exuberant because the poor guy was so hungry and in pain……but he was as content as he could get. And I was proud, because he figured out what his body needed and took care of it. Not something he is always capable of doing. Towards the tail end of this rough patch, when we finally saw signs of him settling down, “Missy” the therapy dog and her owner came by. I love when this happens. Cannon always seems to enjoy it. Missy got up on the bed and let Cannon pet her. He wasn’t much in the mood for that but he obliged. Then, we watched her do some tricks. She was able to bounce a doggie treat off her nose and catch it in her mouth and also catch a thrown frisbee and ball. Townsend was ecstatic! He just loves dogs! Cannon likes them but no where near as much as little man. 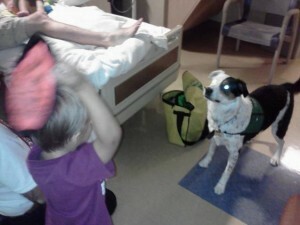 Both boys got to throw each item to Missy several times. Cannon didn’t cry or scream during this time and he seemed to like the experience. We were so grateful for their visit! Around 5:30 p.m., I reluctantly left to take Townsend down to the cafeteria for dinner and a special treat. I always try to take a few minutes with him, just us, when he comes to the hospital. These stays, even though not too terribly long, always seem to alter our relationship for a while. So, I do my best to prioritize him as much as possible in the hospital and especially when we get home. Townsend and I had fun. Dinner wasn’t too bad for a hospital cafeteria and he was THRILLED with the chocolate pudding brownie parfait we had for dessert! Not the norm around our house…..so it IS a real treat. On our way back to the room, we stopped in the Meditation Room and said a prayer for Cannon. It was so sweet to hear Townsend pray for his brother and I was proud of how still he was when I prayed. There is a huge aquarium in that room which is a big draw for my little buddy! When we got back upstairs, Cannon seemed okay. Mark had removed the sock that covered his right hand and they were playing with the iPad. 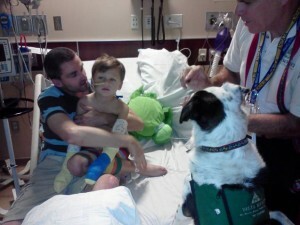 We generally have to cover both his hands during our hospital stays……to keep him from pulling out the tubes. He also has to wear these stiff bands over his elbows (called “no no’s”) to essentially do more of the same. Townsend crawled up on the bed and the boys played with their Daddy and the iPad for quite a while. I got ready for bed, even though it was 6 p.m. because once Mark left…..I would’t be able to leave Cannon’s side, even for a second. He might be restrained but he has ways he can get to those tubes. Before Mark and Townsend left, we watched “It’s the Great Pumpkin, Charlie Brown”…….one of Cannon’s faves. I snuggled in a chair with my little man while Mark got in as much time with Cannon as he could. They left around 7:30 and fairly soon after we began to see the “results” of the medicine. Don’t worry! No descriptions will be provided! 🙂 Let’s just say, the bed was changed countless times and leave it at that. He finished his first gallon of Go Lytely (the solution given to produce the clean out) around 3 a.m. and an x-ray was done at 4. We will see what it says and what will come next! Thank you so much friends for following our journey. And if you have made it this far, for putting up with my complete and utter inability to edit myself! God bless each one of you!